Spring has sprung, flowers and 80+-degree temps are everywhere (at least around LA) and for me spring always means one thing – summer camp is just around the corner!! Sure this sentiment is generally expressed by the 7-15 age bracket, but this will be my 13th summer working at summer camps as a music specialist or director. Lately I’ve been doing a lot of work for camps during the off-season too, usually starting right around now. This past week I was on the east coast for two camp-related projects. I was in the Poconos in Pennsylvania at Perlman Camp where they have hired me to consult with them on a new PA system for their main performance space, Sobel Hall. I snapped the above shot of the stage and surrounding space, including their old speakers. The old system was clunky, problem-prone, and, well… old! So I’ve been working with their Assistant Director to assess their needs, and discuss all the various functions this hall serves over the summer; and working with Guitar Center to supply them with the equipment they need. After Perlman I headed to Virginia to start planning on a fledgling music conference aimed specifically at summer camps, which I am co-leading with a Jewish summer camp songleader. Focusing on music activities for campers, and on song leading for Jewish summer camps, the event will take place in May, and once details start coming together I’ll post more about the great activities and workshops we are planning! 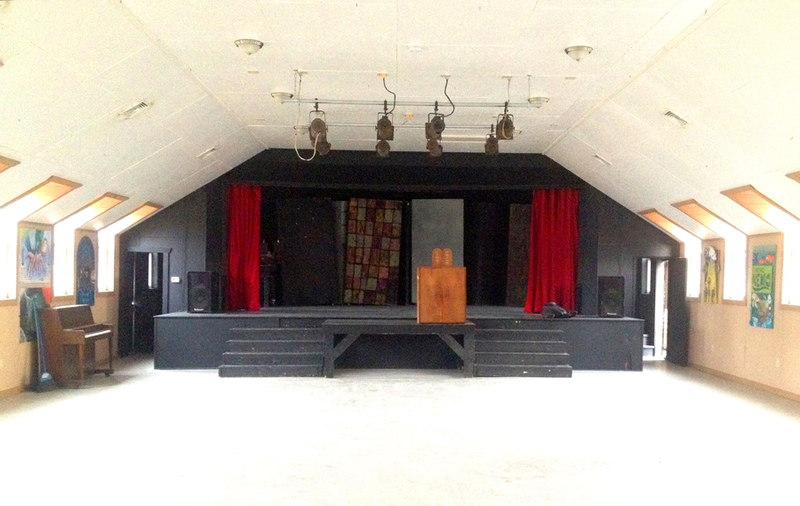 For over 10 years now, though, my home away from home is Beber Camp in Mukwonago, WI, and I’m looking forward to jumping in to equipment ordering, staff training, and watching campers rock out on the shores of Lake Beulah, melting faces from stage, and creating memories to last a life time.